At what point do you just give up? 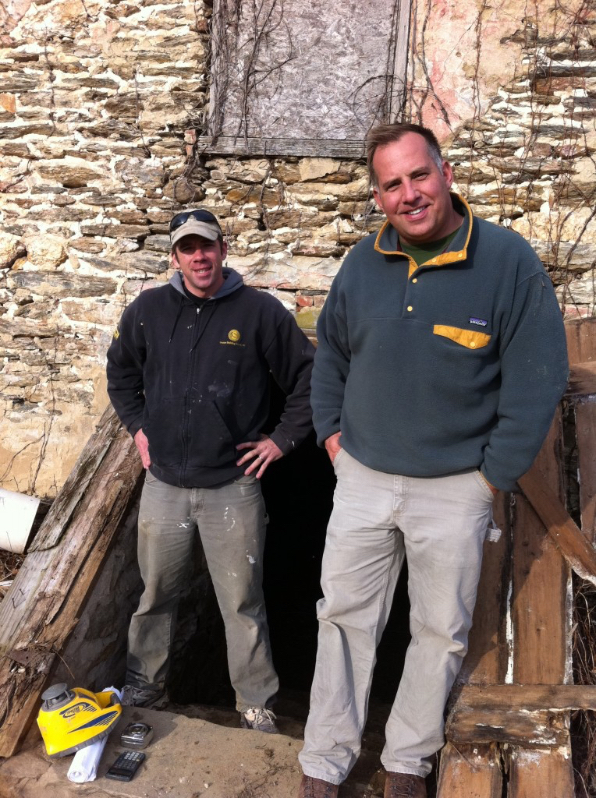 A two-hundred-year-old structure had been in the family for many years, standing vacant for 12 years prior to our involvement. Assessing the initial condition, we all committed to forge ahead – uniting classic processes and materials with new ones to make the homeowners’ vision for the property come alive. 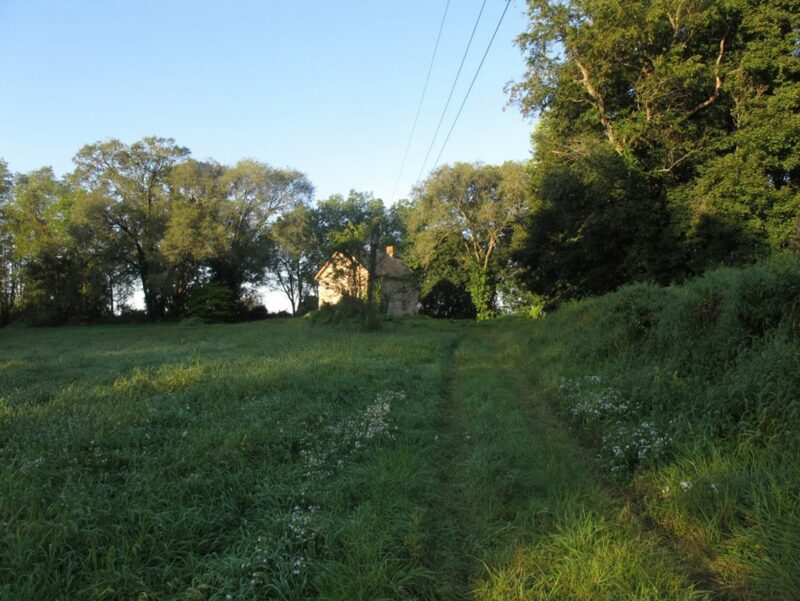 My first time up the grassy driveway to see the stone home took place on a sunny late summer day. For the last 70 years, this was the “back” of the house. If you look closely at the stone work, you can see evidence of an attached shed addition. The orientation of the house may have been rotated to face the center of growing agricultural activities on the farm. 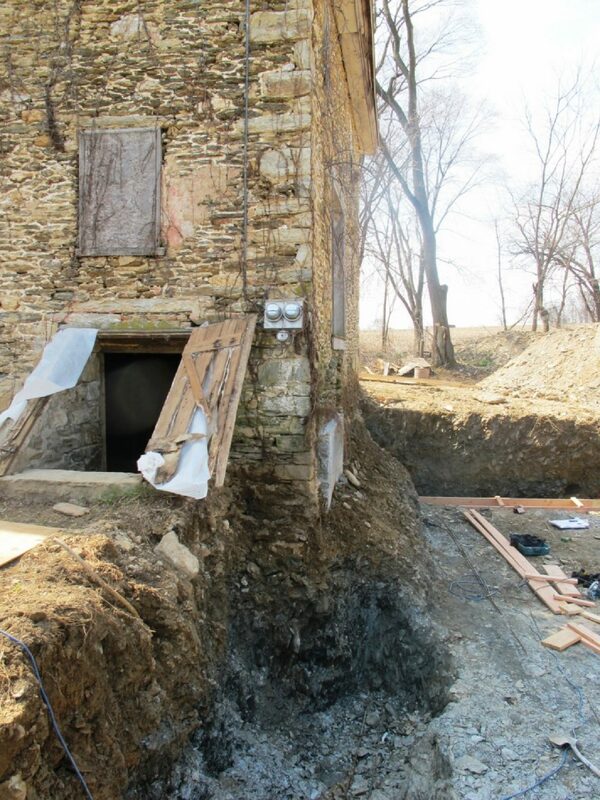 In this photo you can see the barn, of which only the stone foundation remained when we began our project. 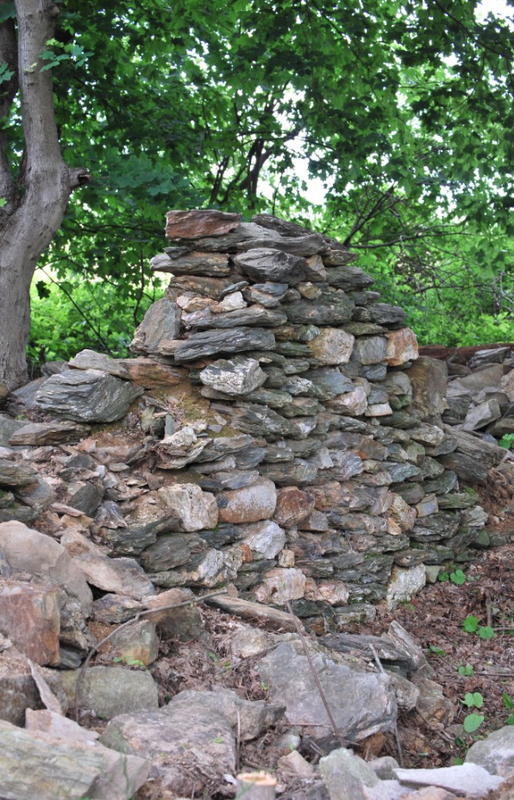 This stonework is a remnant of the barn that was torn down in the 1940s. 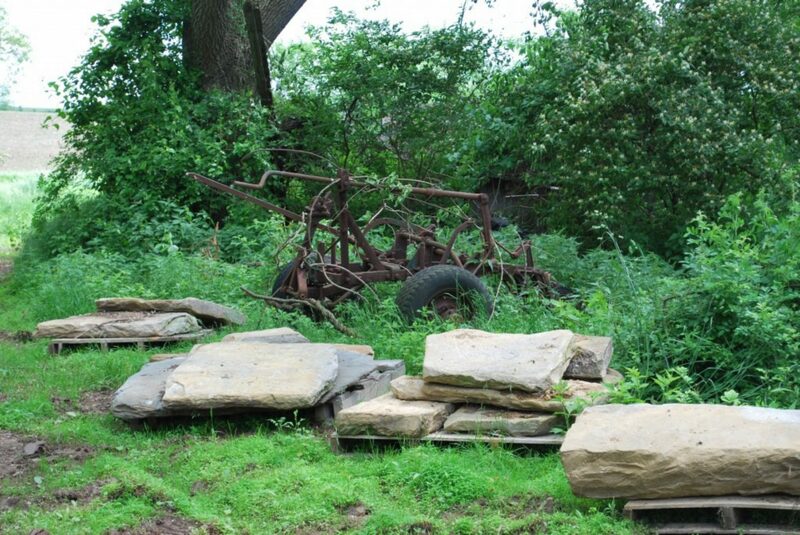 Our masonry team would use these stones to build the addition and repair portions of the existing house. 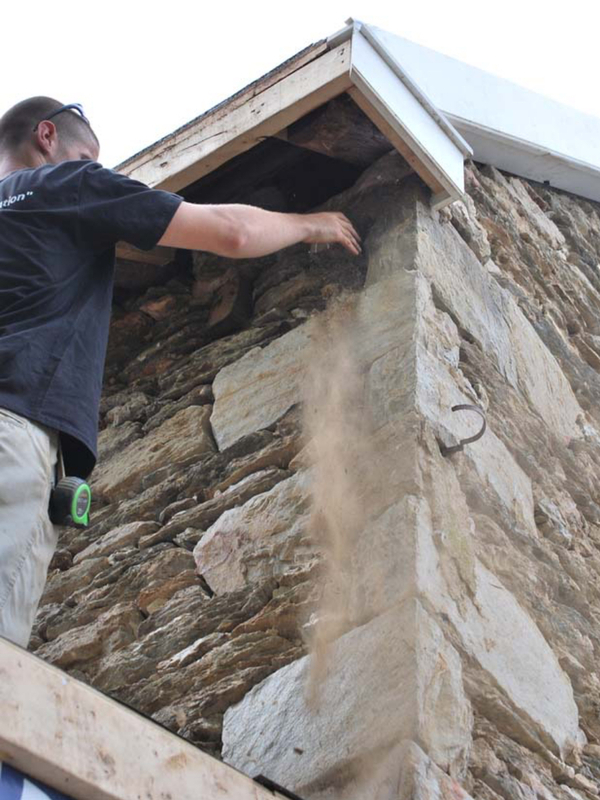 This is real “Green Construction.” Our masonry team from Vintage Stone gathers stones from the old barn foundation, removes mortar still attached and reshapes the stones for re-use in the new chimney and foundation. One of the first steps was to preserve the integrity of the structure. 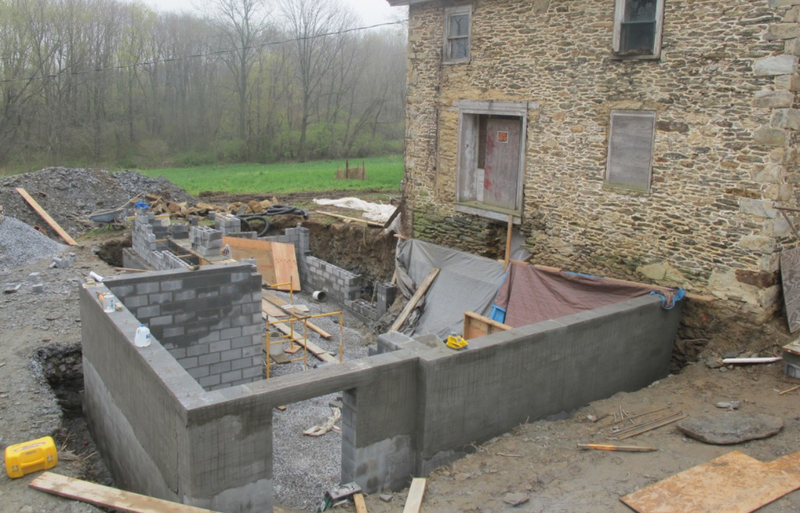 Here, the masons are setting up scaffolding to point stone, while they build the block foundation for the addition in the background. 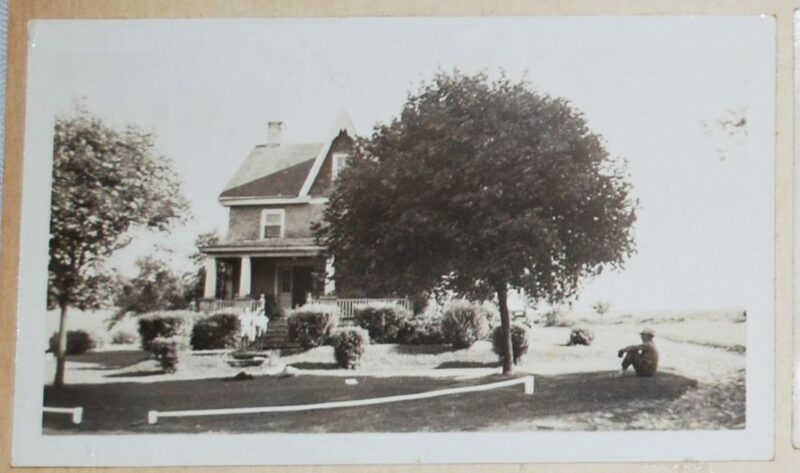 This photo was taken a little over a century into the life of the home. 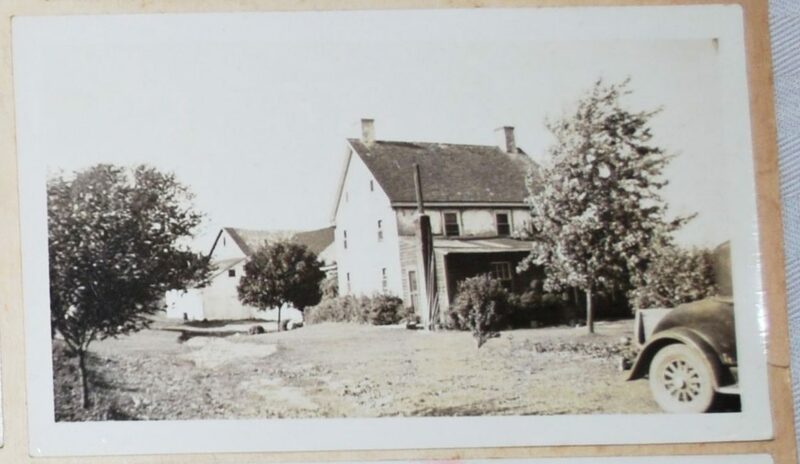 The 1805 stone farmhouse was extensively renovated, with a Victorian era theme. Mark Myers, the architect who lead the 2011 renovation, believes this was when the orientation of the house was rotated 180 degrees. 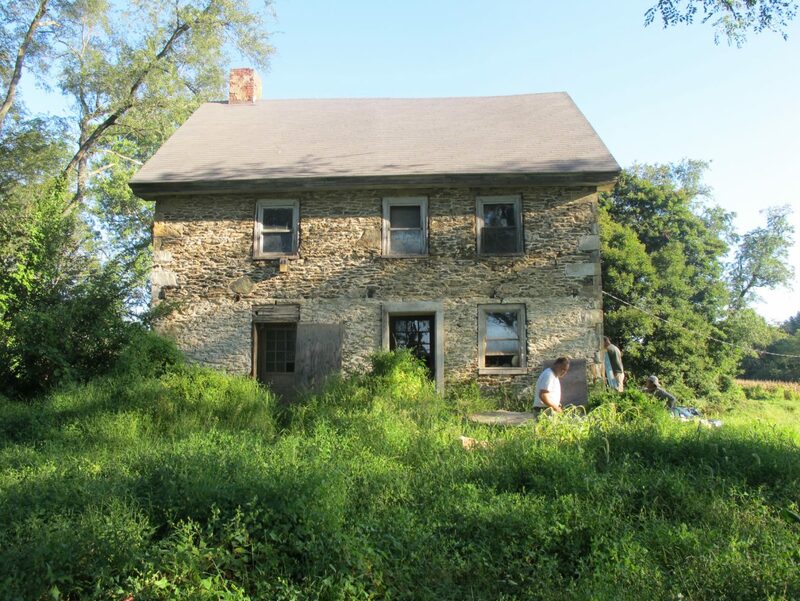 In 1805, when this home was constructed, the builder would have dug out the basement and begun by laying a stone foundation directly on the sub-soil. 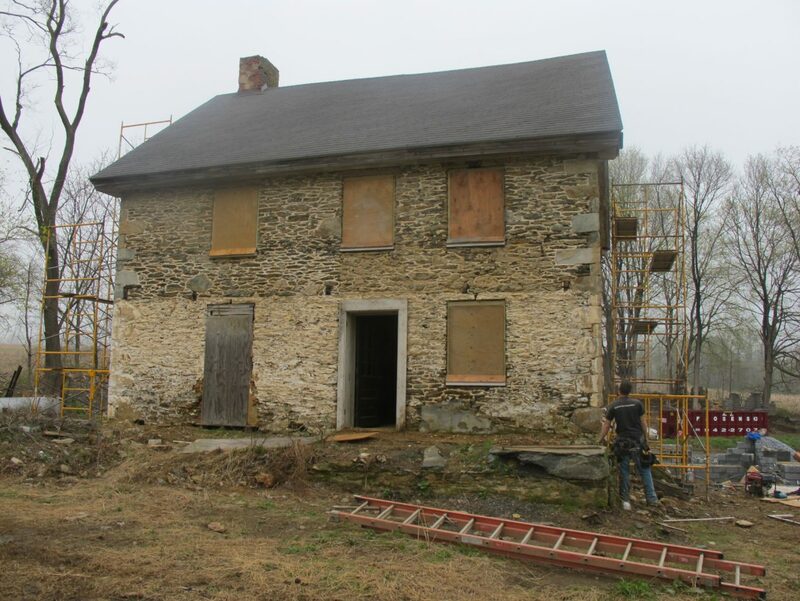 One of the reasons this house was in very good structural condition was because the stone foundation was laid almost directly onto the shale rock. Almost no settlement had occurred in 200+ years. 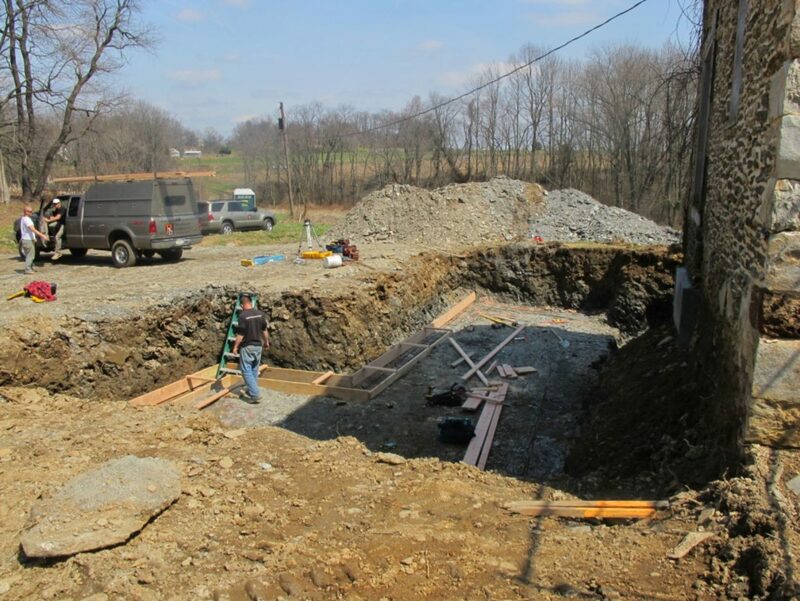 This also gave us additional confidence that we could protect the existing house as we dug out a much deeper new basement for the addition. The foundation walls are close to completion. Next up … carpenters. 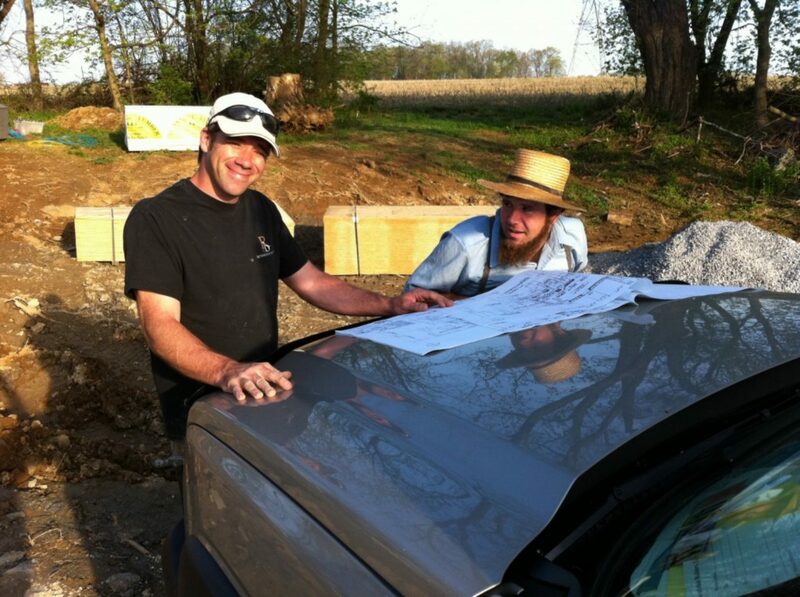 Happy client and happy carpenter. Everybody is happy today! 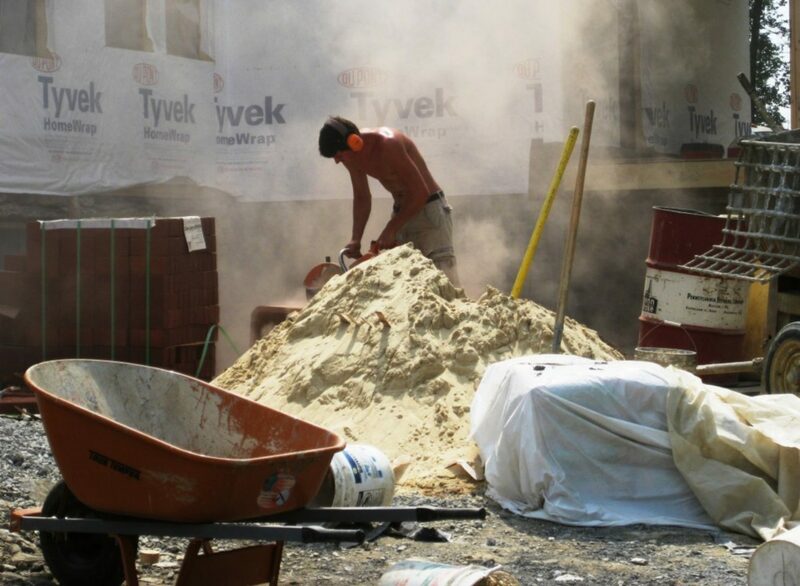 Cutting the flue pipe for the chimney demands precision in a dusty environment. 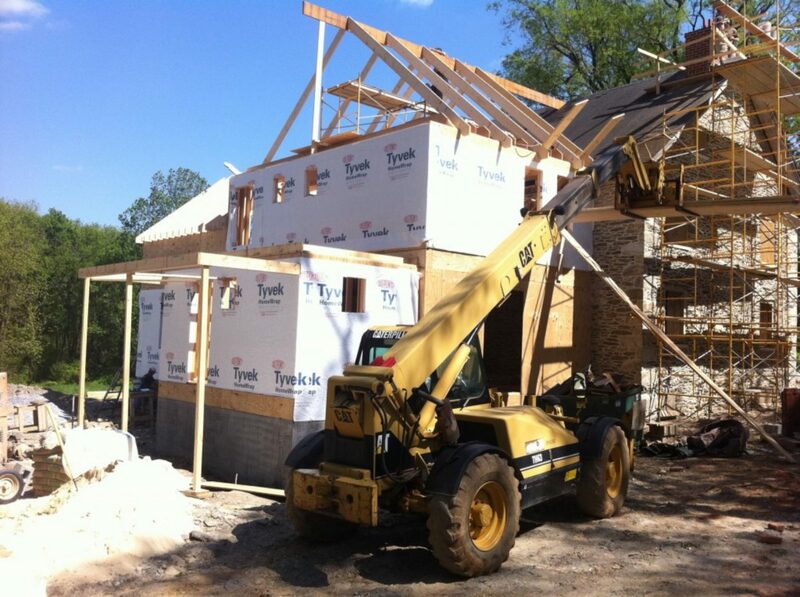 A keen eye will notice that the plans are unwrinkled and new, the first stacks of lumber have been delivered, and framing is about to begin. Smiles all around…this time it will be a piece of cake! 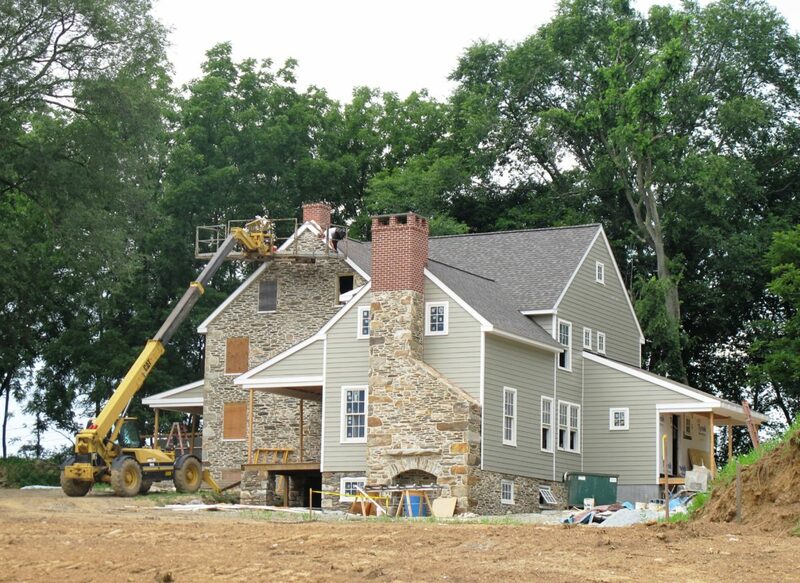 The masons are re-pointing the stone and rebuilding the chimney, while the carpenters are setting the rafters for the addition. A solid foundation isn’t something that is just buried into the ground. 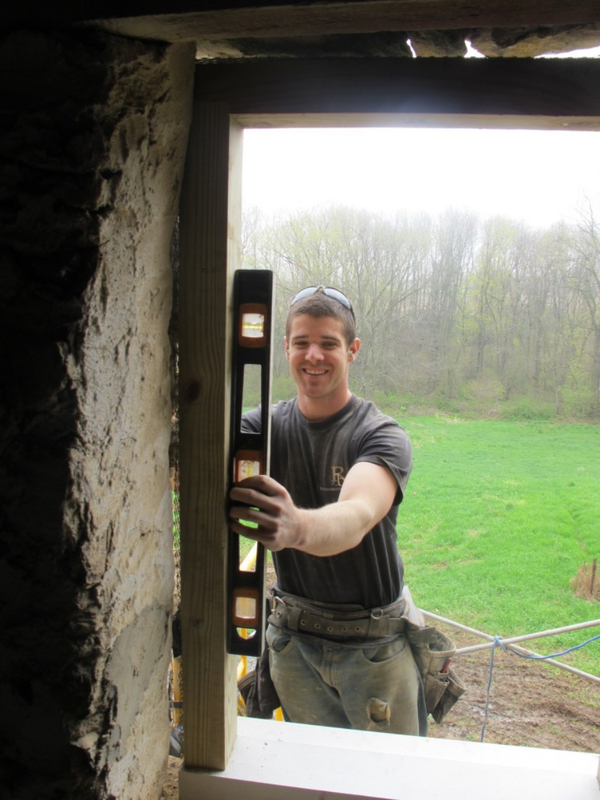 Here, Andrew installs a strong new frame that the mason will mortar into the stones. The new wood window will be installed into this, never coming in contact with the masonry wall. It helps to have a sense of humor when you are working on an old house. Critters and surprises lie in wait behind every old board. In this case, gravity was not Andrew’s friend. 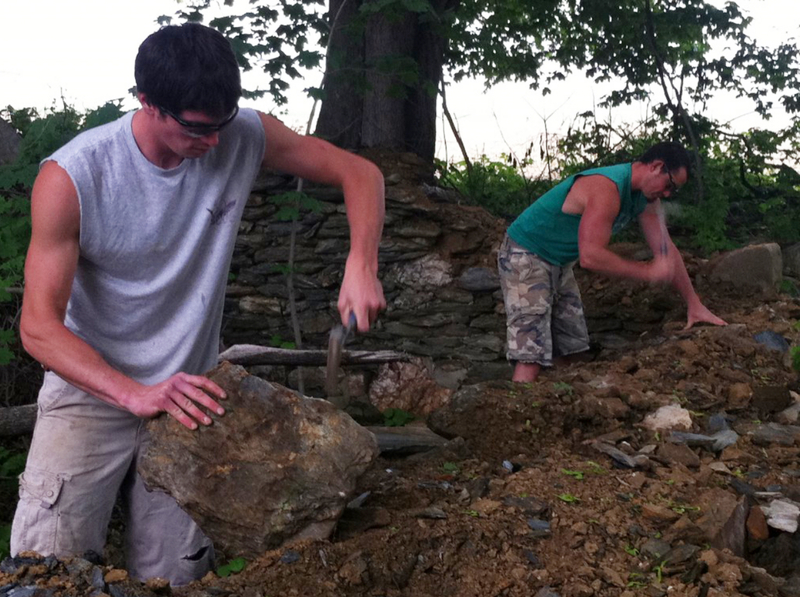 Our homeowner, a landscaper, found these stones which our masons used to create a beautiful new front porch. Based on old photographs, the architect believes there was evidence of a stone porch much earlier in the life of the home. Installing fiber cement siding and PVC based exterior trim. 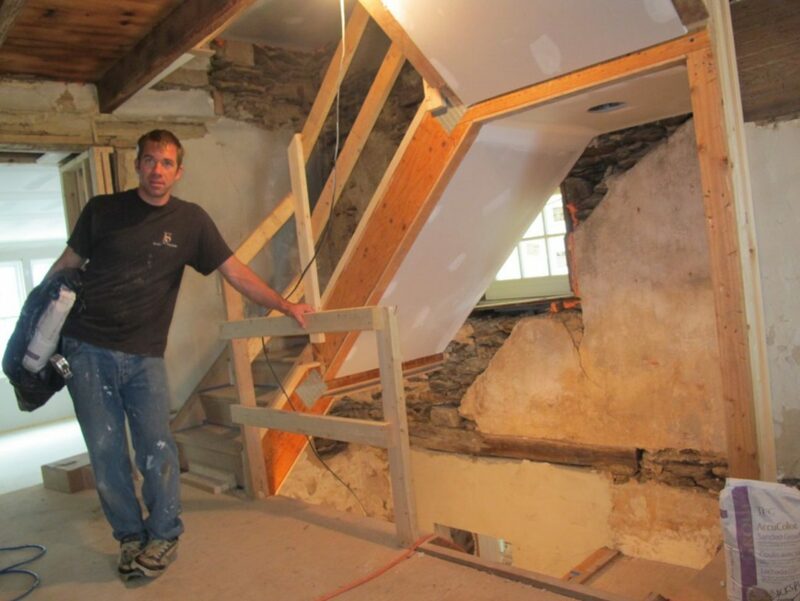 To preserve 18th century look, all plumbing was located in the new addition and heating and air conditioning was supplied from the attic and the basement. This kept us from having to create unsightly chases and comprises. The big challenge was to connect all four levels of the existing home with aesthetically pleasing and comfortable stairs. Please check out the finished stairs and see how the rest of the home turned out in our portfolio section.